The major deliverable of a clinical study is an organized collection of documents called a Trial Master File (TMF). The FDA (or any regulatory authority) may review the TMF to determine whether the drug, device or diagnostic product is suitable for marketing. The ICH Guideline for Good Clinical Practices (E6 (R2)) Section 8 specifies the minimum set of “Essential Documents” that the study sponsor and/or investigative sites should retain. The Drug Information Association (DIA) Document and Records Management Community has expanded that list to create the “Trial Master File Reference Model,” which organizes the documents (“artifacts”) that should be collected and filed in the TMF. Various companies offer electronic-TMF (eTMF) software products to help study sponsors collect and manage these documents. Investigative sites collect Essential Documents and other documents in paper form in a regulatory binder and/or in electronic form in an investigative site file (ISF). Various companies offer electronic-ISF (eISF) software products to help investigative sites collect and manage these documents. Model Agreements & Guidelines International (MAGI) has created a standard table of contents for site regulatory documents. Once a sponsor has an eTMF system and a site has an eISF system, the obvious next step is to automate the process of uploading documents from the eISF system to the eTMF system. Similarly, some documents, starting with the protocol, could be transferred from the sponsor’s eTMF to the site’s eISF. However, these transfers are complicated by the fact that there is not a one-to-one correspondence between the documents in the two types of systems. In addition, the two systems might have different names and metadata formats (e.g., author, date created, version number) for the same type of document. 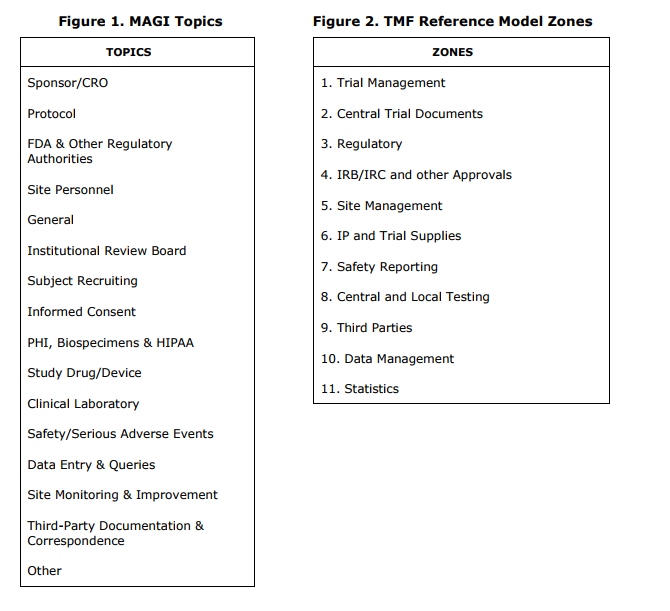 It would be easier to transfer documents between eISF systems and eTMF systems if both systems “spoke the same language.” To facilitate this process, the authors have mapped MAGI’s Regulatory File Table of Contents (https://www.magiworld.org/standards/) to the Trial Master File (TMF) Reference Model. As seen in the document at http://www.firstclinical.com/journal/2017/1708_ISF_vs._TMF_table.pdf, there is a logical home in the TMF for most ISF documents. However, as seen in Figures 1 and 2, sites and sponsors organize their documents differently, in the manner most efficient for their respective own use. 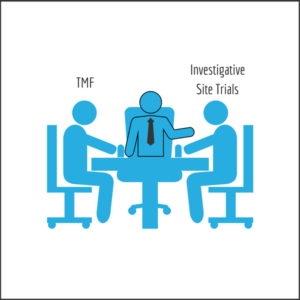 The adoption of eTMF and eISF systems offers substantial efficiency, quality and timeliness benefits to both study sponsors and investigative sites. Now is the time to define standard eTMF “sockets” for transferring documents between the two systems. Sholeh Ehdaivand is President and CEO or LMK Clinical Research Consulting, a TMF consulting and services company. Contact her at 1.704.464.3291 or sholeh.ehdaivand@lmkclinicalresearch.com. Betsy A. Fallen, BAFallen Consulting LLC, is an independent consultant advising sponsors and sites on efficient and compliant clinical document management process and technology. Contact her at 1.610.716.3271 or betsyfallen@bafconsult.com. Norman M. Goldfarb is Managing Director of First Clinical Research LLC, a provider of clinical research best practices information services. Contact him at 1.650.465.0119 or ngoldfarb@firstclinical.com. Amy Lounsbury is the Research Department Manager for Minnesota Gastroenterology, PA. Contact her at 1.612.870.5595 or amy.lounsbury@mngastro.com.